Rachel Sobel, with the Vanderbilt Eye Institute at work in clinic. The intricacies of preparing a reed for an oboe resembles the skill set necessary for oculoplastic surgery. As a once aspiring oboist, Rachel Sobel, MD, relates to the comparison. As a matter of fact, she wrote her college essay about the challenges of carving reeds. It helped her get into Harvard. After nearly a decade of playing the oboe in orchestras, chamber groups and summer music camps, she believed it was her calling. Upon entering college, Sobel had her sights set on becoming a professional musician. But she soon discovered two very important facts in her quest. It turns out she didn’t like music theory — a key course for music majors — and she wasn’t as great an oboist as she thought. Sobel, whose father was a physician, declared her major in history and science and became drawn to the idea of reporting on medicine, which led her to an internship at ABC News, where she researched medical breakthroughs for their medical correspondent. She then secured an internship at U.S. News & World Report, working on the college issue and medical stories, which she continued after graduating from college. She also interned at the Pittsburgh Post Gazette for a few months. “I was interested in learning about medicine and the history of it, so why not report on it and learn about it as it unfolds in current events?” Sobel said. “I loved the exciting pace of journalism, writing stories and talking to people about exciting new findings. After graduating from college in 1999, she wrestled with the idea of being a journalist and writing about medicine or practicing medicine. A book called “The Measure of Our Days” by Jerome Groopman that her father gave her helped her make a decision. “I admit. I was all over the map,” said Sobel. “While I was a journalist, I felt like I was doing some really exciting stuff and in the thick of things. Sobel also credits her mother, an elected official in Florida for 24 years, for inspiring her to serve others professionally. Sobel entered medical school in 2002 at the University of California, San Francisco, and continued writing. She penned a monthly column for U.S. News throughout her four years in medical school. While a resident at Wills Eye Institute, she wrote a column, “Scrubbing In,” for the Philadelphia Inquirer. For Sobel, her path to medicine, ophthalmology and, eventually, oculoplastics is all part of a journey that she has let naturally unfold. When Sobel first entered medical school, she thought she was interested in cardiology or oncology. But after taking an elective in ophthalmology she found the right mix of surgery and medicine. As an oculoplastic and orbital specialist at the Vanderbilt Eye Institute, Sobel specializes in the structures around the eye. A trained ophthalmologist, her practice focuses on eyelid reconstruction, droopy eyelids, tear duct surgery, orbital fractures repair, thyroid eye disease, orbital tumors and eye removal. Her research interests include tearing, dog bites, facial nerve palsies and orbital infections. Sobel joined Vanderbilt in 2015. She serves as the residency curriculum liaison for oculoplastics. 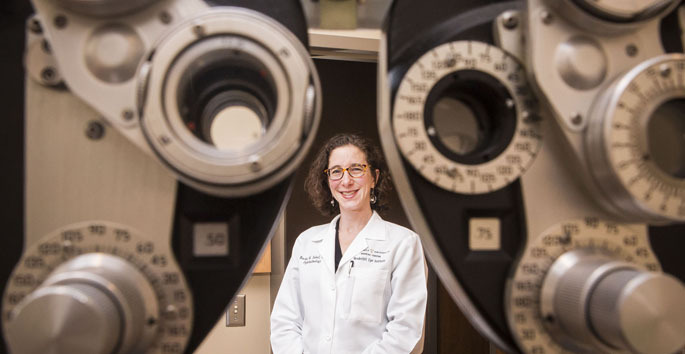 She was recently named the inaugural associate editor for new media for Ophthalmology, a role that combines her love of writing and medicine. She points to her interaction with patients and residents as a source of motivation. It’s the progress she is able to witness that gives her purpose. “I went into medicine for two reasons — the intellectual aspect fascinated me and the personal, soulful side of medicine attracted me,” she said. “On a day-to-day basis you often forget about these things. It’s one of the reasons I love being around trainees, because you remember that time and what influenced you,” she said. “One of the most satisfying aspects of being involved in training is being able to see the resident’s progress. When she is not working, Sobel enjoys swimming, spinning class, cooking and her favorite pastime, her family. She is married to David Whelan, whom she met while in college. The couple has three children, Josie, 12, Eli, 8, and Stanley, 3. Sobel and her husband alternate taking the children to school, a task Sobel relishes. While enjoying the simplicity of her daily interactions with her children, Sobel also thrives on the complexities that her job demands. She has been able to fold the contrasting worlds into a life that complements her. “You know, the medicine piece has always been there. I just didn’t know how I wanted to approach it. If I had gone straight into medicine, I wouldn’t have been able to experience the writing world. It is stowed away for now. But her 8-year-old plays the cello. And that, she said, is music to her ears.